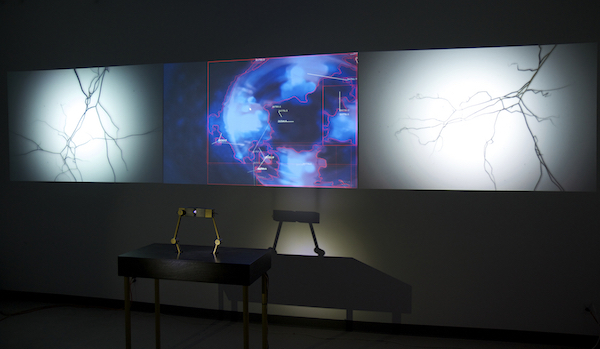 The installation is composed of two microscopes watching and recording each other and a three screen projection which visualizes the process of interpretive analysis occurring within the software. The bank of footage for this piece comes from two separate shoots; the first in the summer of 2000 and the second a week after/post 09.11.01. A series of prints made from screencaps of the auto-translate and captioning feature of Youtube, applied to the 1957 Soviet film directed by Pavel Klushantsev, Road to The Stars. 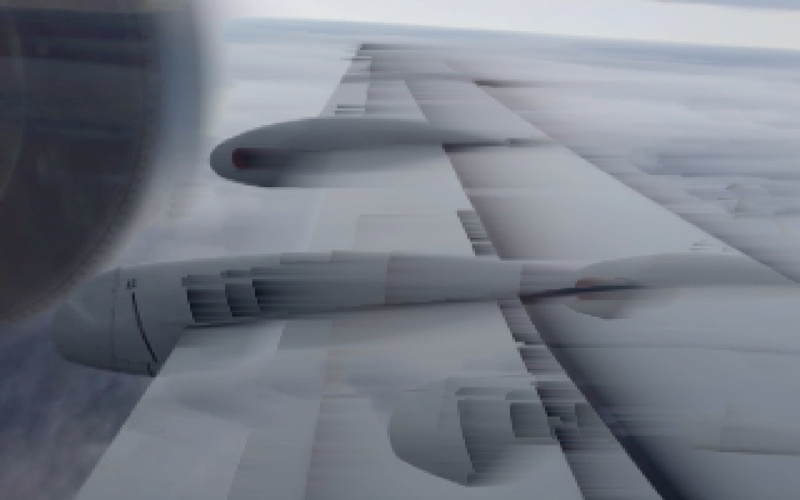 dresden.cuba.clouds is a generative video which incorporates imagery from the skies above the city of Dresden coupled with footage of clouded ice formations and video from the Museum of the Revolution in Havana. Teachable Moment (M. De Sade) is a détourned puzzle ball, a learning toy meant to impart problem solving in a maze like format. The original object has been disassembled and the ball bearings replaced with small rocks and building material from the ancestral chateaux of the Marquise de Sade in Lacoste, in the south of France. 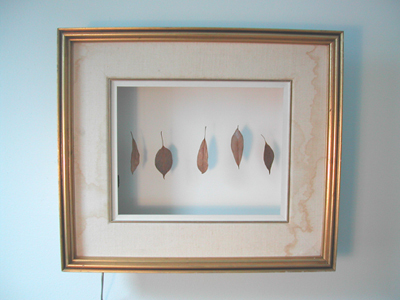 This is a series of prints which have been altered from their initial state by processing them through custom software. 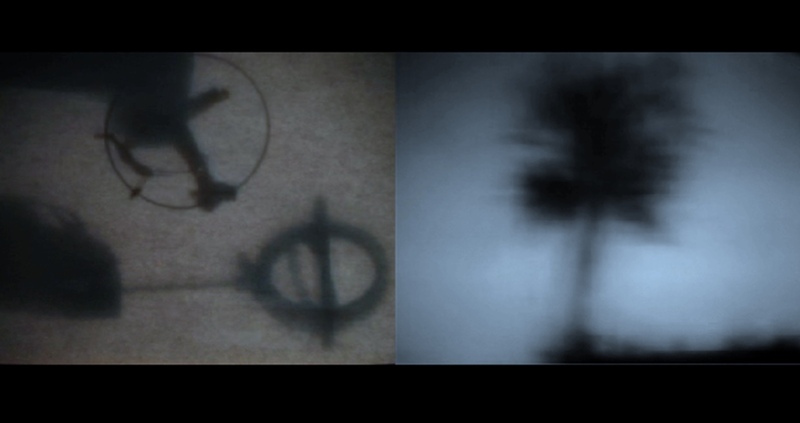 The initial photographs were manipulated through a series of iterative and stochastic routines resulting in these computationally augmented images. This is a series of videos I shot and then edited with Ian Ilavsky (Constellation Records) for the modern chamber ensemble Esmerine. 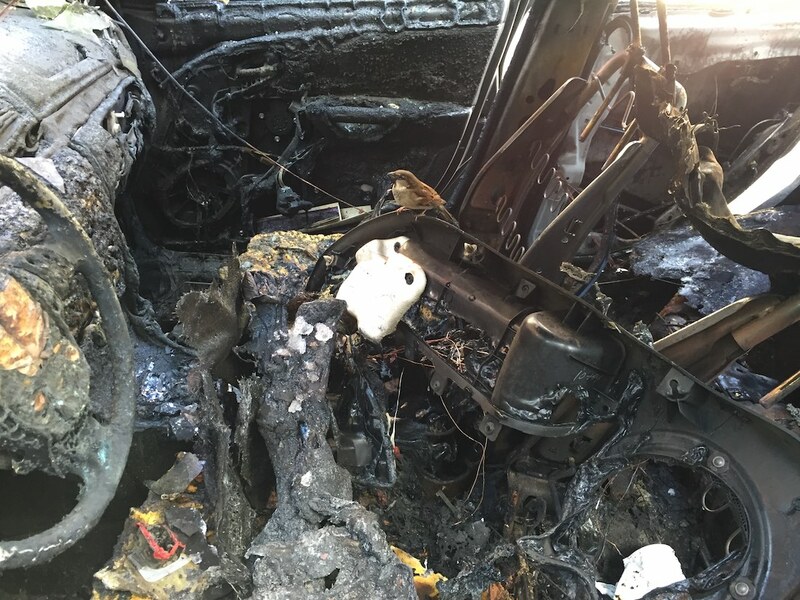 This suite of photos (series of prints) was taken the morning following an arson attack on a car in my neighbourhood of Montréal. 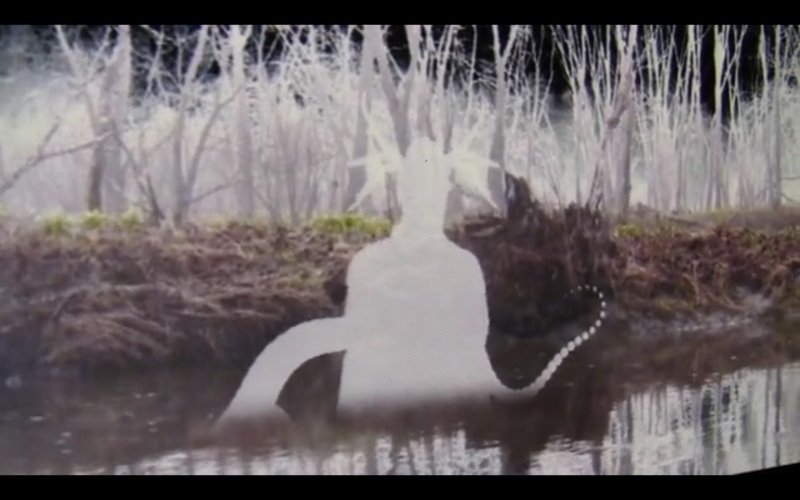 This is a video I made for Sarah Neufeld's (Arcade Fire) song off of her debut solo album. Heatsink is a two screen projection intended for large vertical indoor spaces and outdoor building facades. The system downloads (in real time) videos from youtube which are tagged with custom terms depending on the venue/theme. The ideal presentation uses the tag "protest". 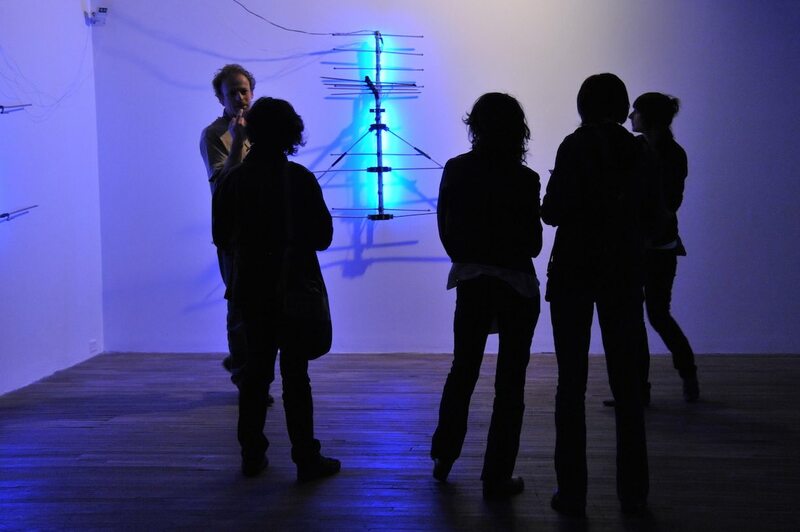 Two weathered antennas mounted in a corner are equipped with responsive blue fluorescent lighting and act as EMF sensors in a sonification of the corners' electromagnetic signature . The corner of the room is also a 'puddle' of HSS audio which provides an intense and focused reactive sonic environment. A gentle and minimalist rumination on reception, enaction and embodiment. 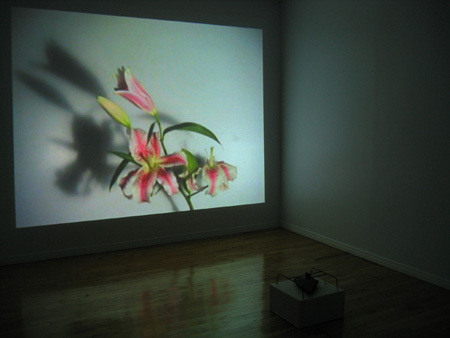 A microscope on a shelf and a telescope pointed out the window skywards provide the live video feeds for this all white work (gesturing towards a techno-scientific aesthetic), coming together in a single image on a wall mounted LCD screen. Viewers can manipulate the microscope with fetishistic proximity over a defunct 50 Franc note bearing the image of Antoine de Saint-Exupéry's "Le Petit Prince". 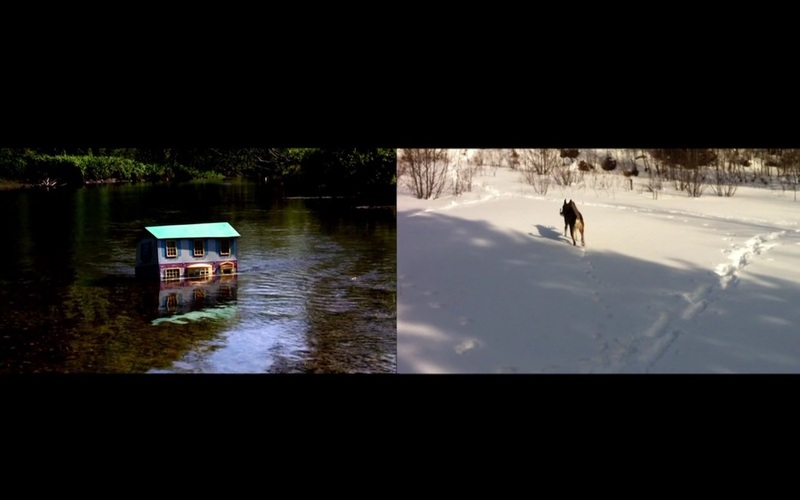 The conflation of the micro and the macro in a single video image provides the backdrop for a critical reflection on money, politics and optics as well as speaking to a deeper, more nuanced articulation on desire. 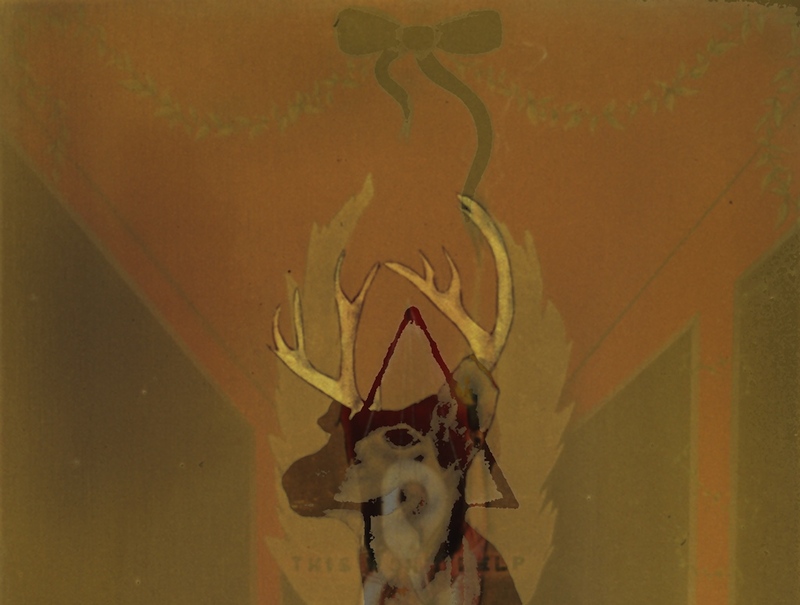 ""Snow Day For Lhasa" features lyrics, guest lead vocal, and piano by Patrick Watson, who also tracked and mixed the song with Esmerine. 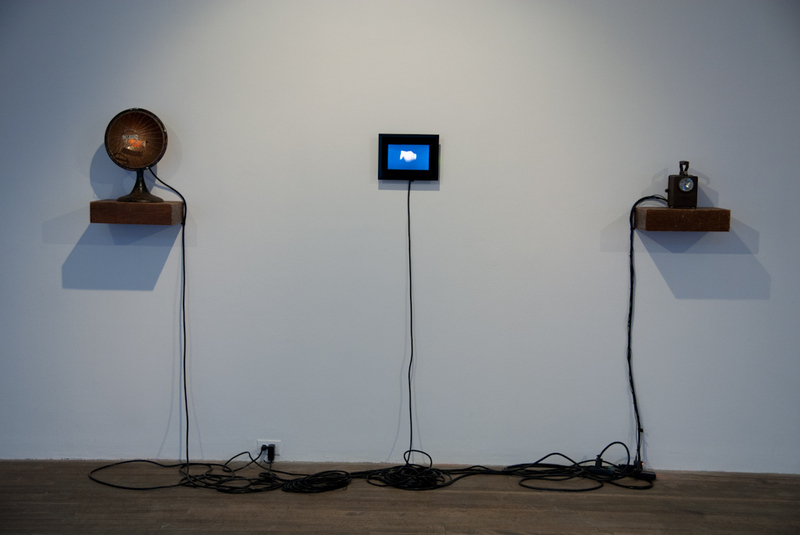 This work utilizes an antique heater (1917) and railway lineman lamp, a video of a handshake, an arduino microcontroller and 125 feet of black cable. Inscribed with the brands "Majestic" and "Wonder" respectively, the heater/lamp combination enact a primitive form of dialogue: one turns on the other, killing the power to itself, back and forth in an infinite loop of consumption. 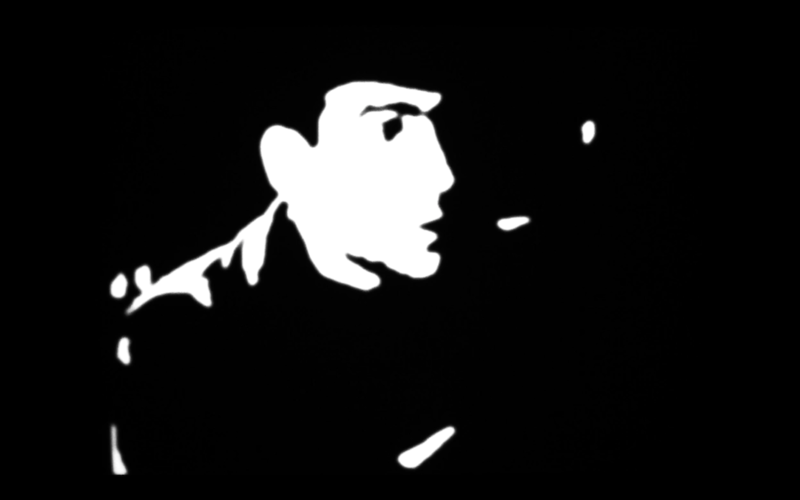 This work consists of a database of up to 200 "film noirs" spanning the decades of 1930-65. 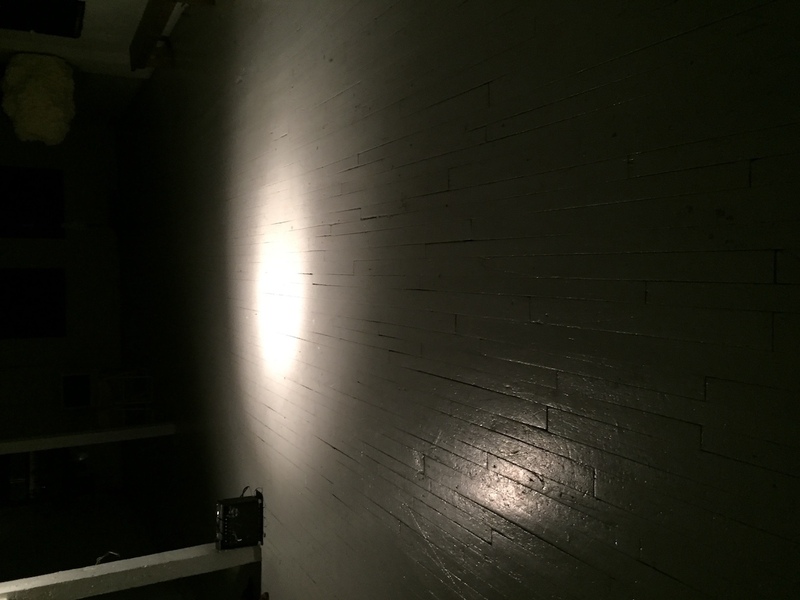 Depending on context the piece has flexible screening times ranging from a live scored performance of 35min to an unlimited cycling of days, weeks or months for exhibition/screening purposes. 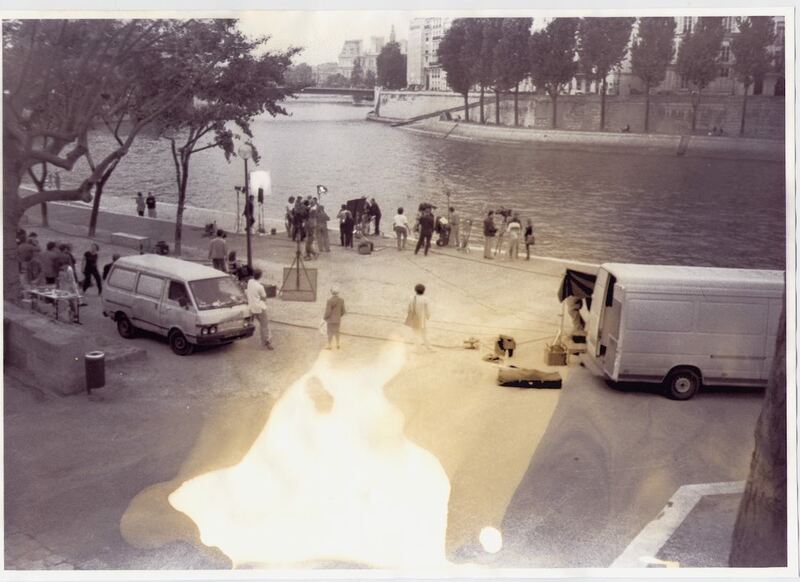 The system reads a film randomly from the database and extracts only the color black from the image in real time and presents it in inverse visibility against a letterboxed tableau. auto suggestion I is a screen based, real-time visualization of the processing of a database of paintings. The work incorporates the full text of Baudelaire's one surviving notebook “Journaux Intimes”, 65 hi-resolution scans of paintings that I made during the decade 1989-1999 (at which point I stopped making paintings), a large projection of the running system (or presented on a LCD screen) and an archive of eight large giclée prints made from the resulting output from the process. auto suggestion II is an antique metal filing cabinet of library card catalogue scale. 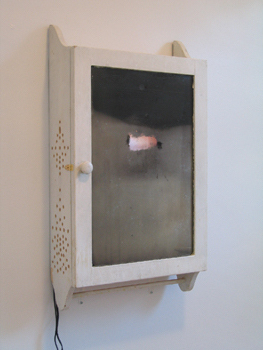 Embedded within this object is a series of ultra white LED's and a custom circuit with an arduino microcontroller. These blindingly bright white lights signal in binary code any time a source word from a database of terms is found while searching through a large aggregate of world news rss feeds. The words used are "missing, disappeared, lost, absence..." and so on, all relating to the theme of missing persons, and the lights blink out the word found after the systems conversion of the adjective to its binary equivalent. 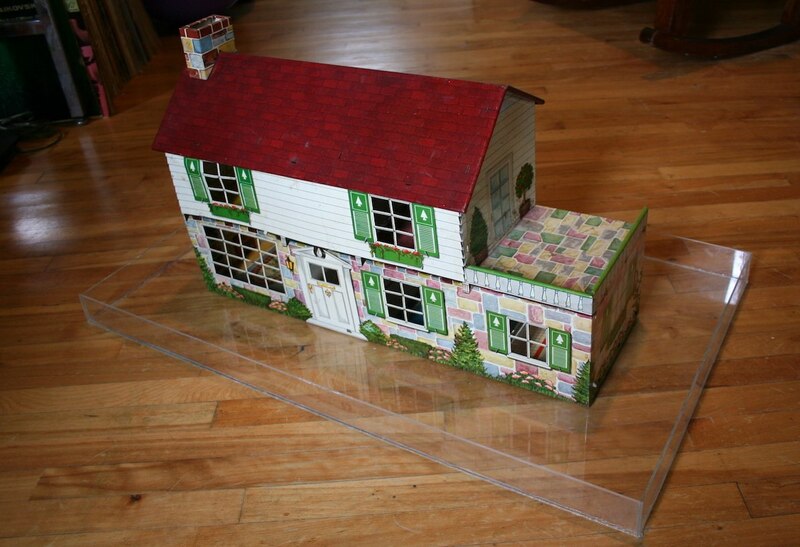 An antique metal toy house sits immersed in water inside a large and shallow plexiglass tray. Inside the house is a water pump which responds to a network of eight wireless sensor units distributed throughout the exhibiting venues entire building. These discrete yet sentient nodes monitor the minute changes in humidity of a given building’s interior. 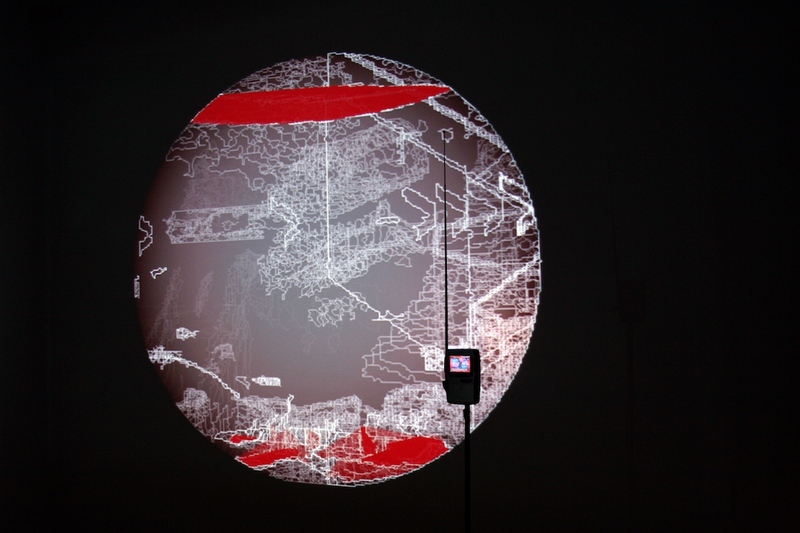 redTV is an installation incorporating a live TV signal, a small Television, custom software and a projected circular video image. 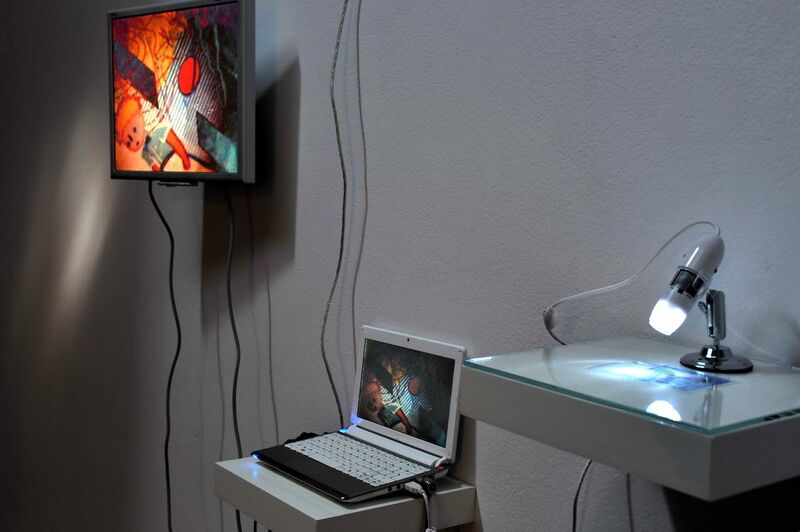 The TV signal is fed into a laptop using a analog to digital video converter and is then accessed via the redTV application, using the OpenFrameWorks library for C++. 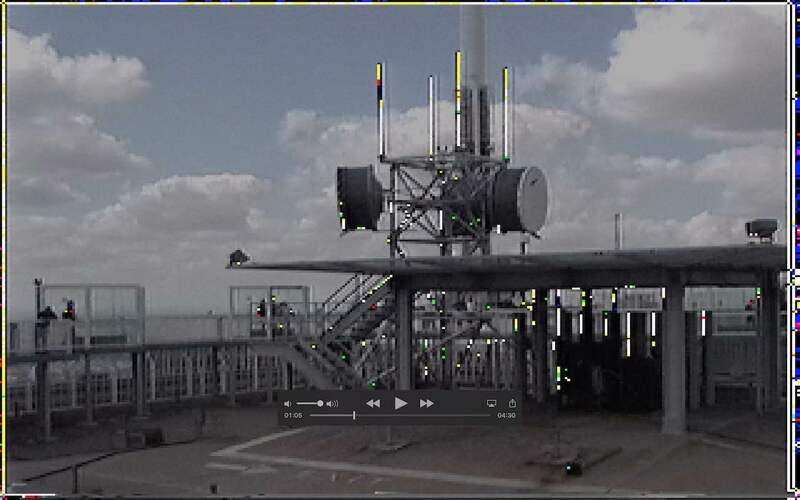 The image is analyzed and any areas of red are then isolated and tracked in real-time, leaving behind a trail of image outlines which gradually, over the course of several minutes, fade away. In this manner a complex and dense environment of filigreed lines emerges and dies out, tracing and mapping an evolving history of the underlying visual mechanics and sight lines the cameraman/editor/producer consciously or unconsciously constructs. 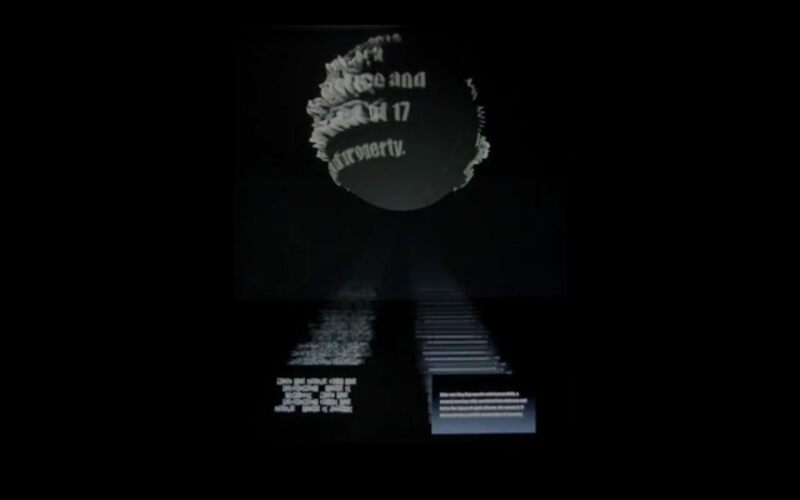 These works stem from a 2003 net.art project titled "Alt+Delete", and the doctored photos are the results of several screenings (including the Viper new media festival in Basel, Switzerland and le Musée du Québec) where anonymous viewers visited the site on the net and by clicking on one of two buttons in the interface, telerobotically intervened upon the physical image in my studio. 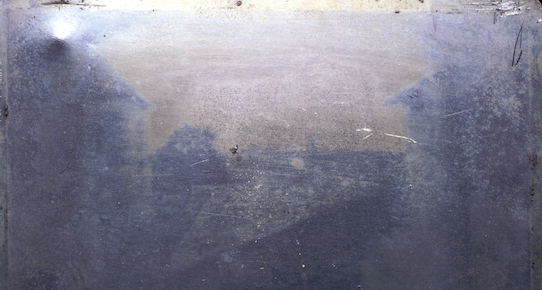 Ghost is a series of montage pieces, (in the classical sense), and are composed of photos that I have taken in a number of different locales around the world. 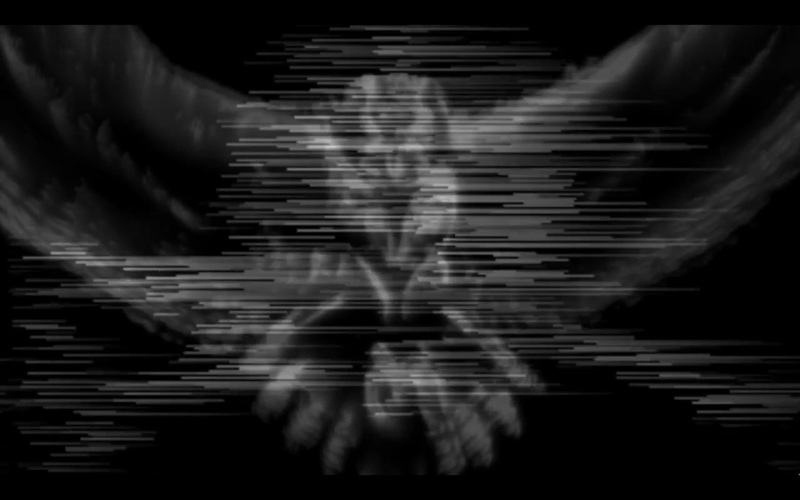 The project is really a visualization of some of the elemental principles of the way images, when combined, create a “third meaning” in the Eisensteinian sense. Volat hora per orbem ("The hours fly around in a circle")- Manilius (Manlius or Mallius, Marcus or Caius), from Astronomica the language of clocks is an installation which incorporates a time-lapse video projection of a lily and a small servo motor attached to a nail that scratches a circle into a piece of shale rock. 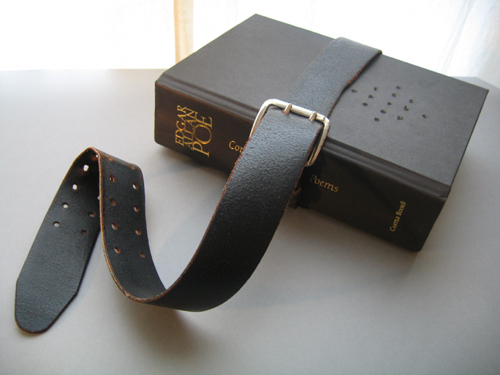 ...incorporates an emf sensor and speaker inside a hollowed out copy of Poe's complete works. When switched on the book becomes a mobile emf detector and renders audible the invisible flow of electromagnetic currents in the environment. 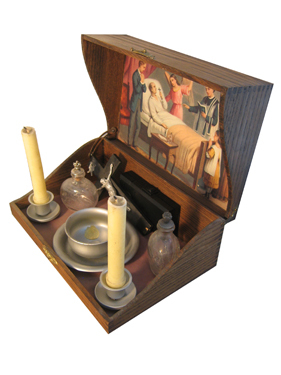 ...is a wi-fi enabled antique wooden carrying case equipped with a highly sensitive humidity/temperature sensor. This sentient object, embedded with unknown histories, sits omnisciently in a space, registering the slightest variation in ambient weather patterns. 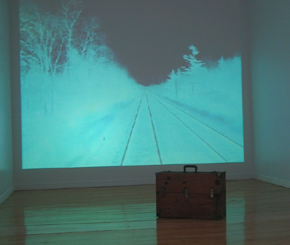 The variable climactic conditions which the suitcase registers are controlling the filmic image of a train, seen from the last car, a kind of homage to the early cinematic obsession with trains and mechanized travel. 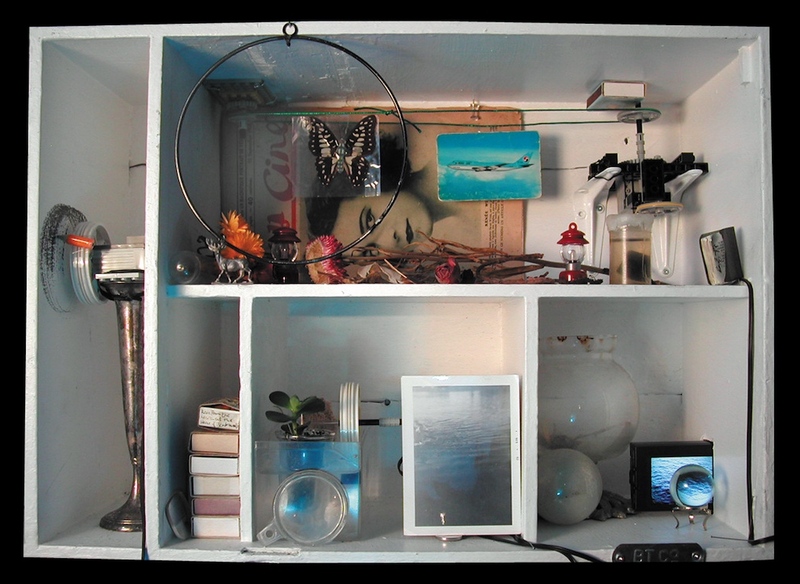 this work consists of a dessicated old cabinet, webcam, LCD monitor and TX-1 mini PC, running PD for the video/audio modulation. 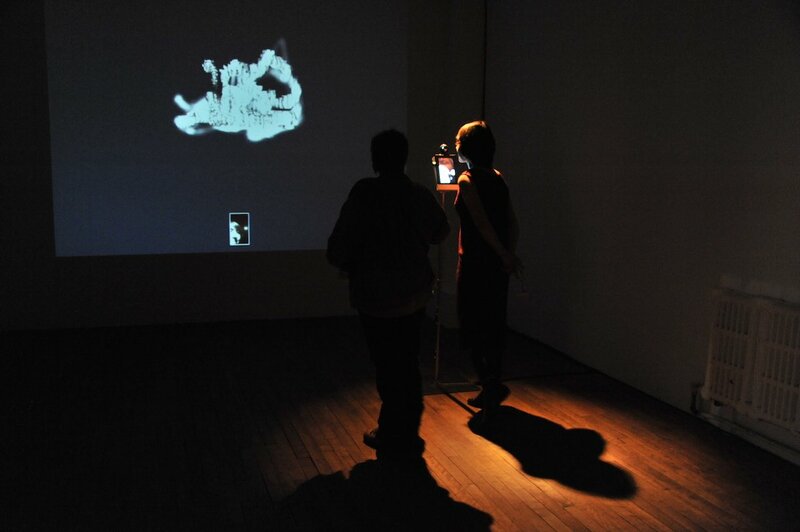 Shadowplay is a collaborative Telerobotic project with Alan Dunning (Einstein's Brain Project). This project consists of two seperate robotic armatures which reside in Calgary (Canada) and Montréal respectively. These autonomous agents are networked together via max/msp and speak to one another through the Net. The robotic events are backlit and filmed as shadows behind a white screen. 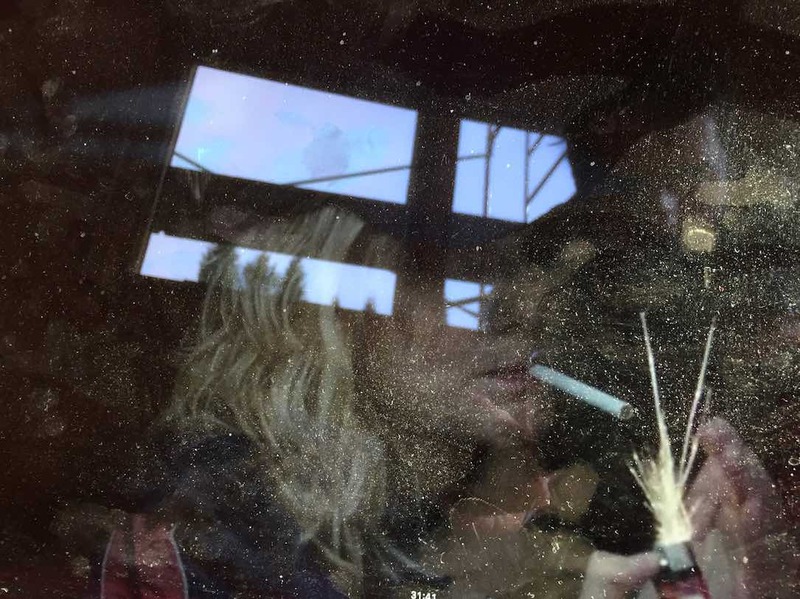 The constructions are causal as well, each influencing something else such as the agitation of a plant (in Dunning's case) or the manipulation of photographs (Todd's machine). 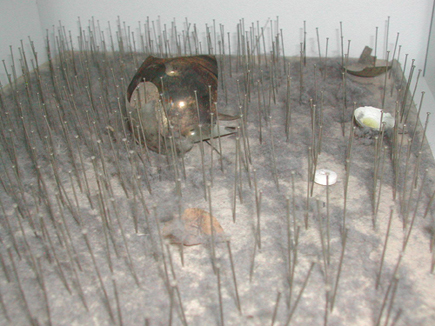 ...(“goosebumps” in English) is a telerobotic work which incorporates a book interface covered with a grid of pins to trap dust and provide a surface for sonic manipulation. The book is played by dragging a tiny microphone attached to a lock of my deceased fathers hair (DNA) through the pins and dust. 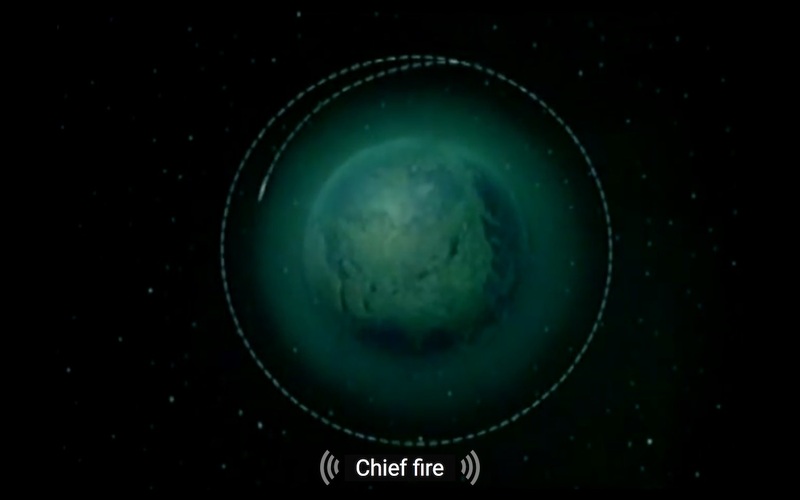 The hair is close mic’d at the point of contact and generates a minimalist soundscape which is created by manipulating a small robotic mechanism from the website interface. 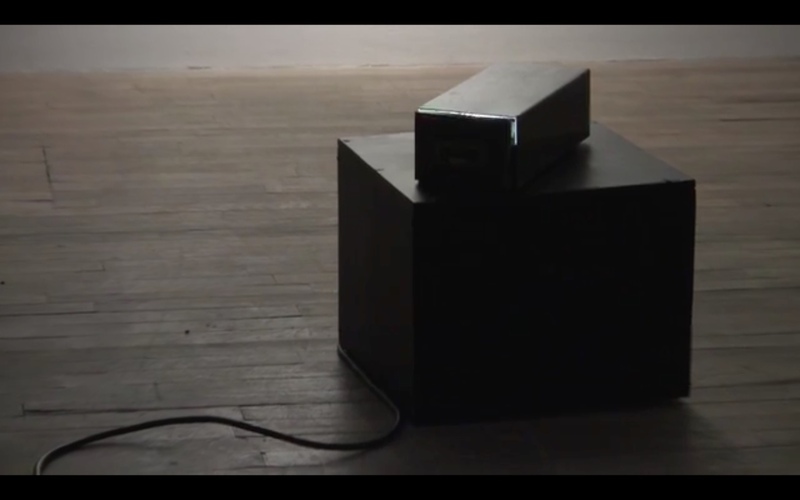 The video image is a live feed of the book/pin/dust/hair construction and the interaction takes place in real time. 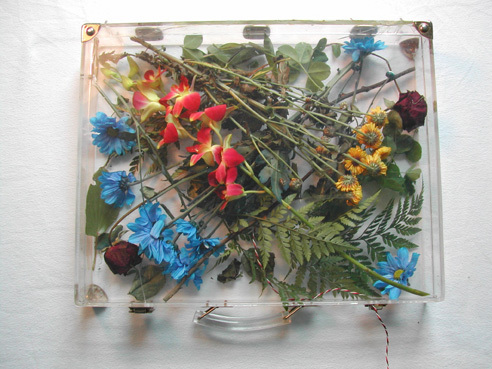 A weathered, transparent briefcase holds a mass of flowers which, after a couple of days of decay, begin to breakdown in the hothouse of the casing and elevate the temperature and condensation of the interior. There is a temperature sensor inside the briefcase which at a certain point is switched when the heat is peaking, in turn controlling a large projection of hands which after hovering in space and waiting "come alive" as a result of the flowers demise/transubstantiation. 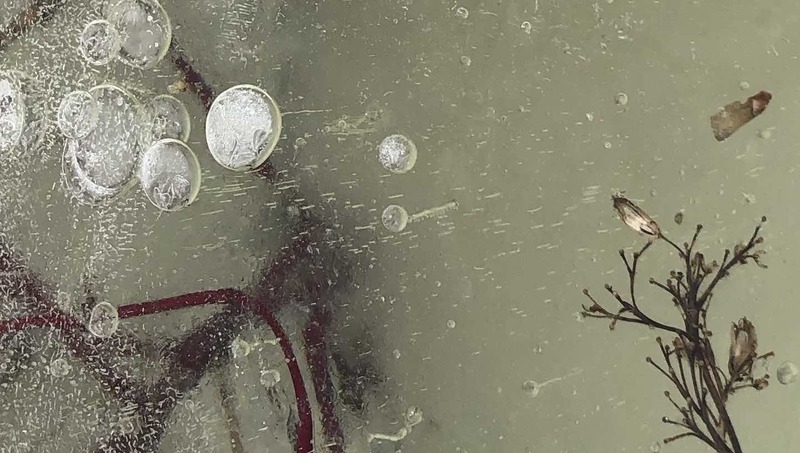 ...is (when exhibited) a live stream from my studio in Montréal of a glass tray containing a photograph immersed in water. The left side of the interface holds two images of, respectively, the original manuscript for Baudelaire's "Spleen de Paris" and Proust's "A la Recherche de la Temps Perdue". 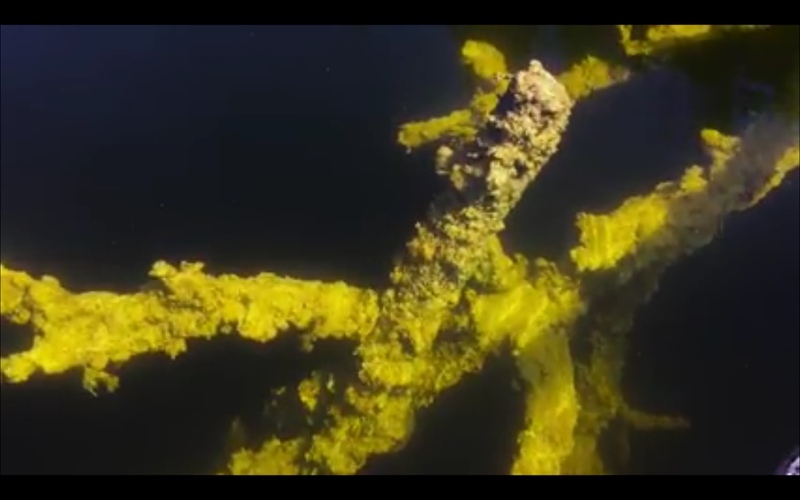 By clicking on the two gold rings (buttons below the video image) you are directly controlling a small robotic armature which shakes and collides two small glass vials that hover above the tray which contain bleach in one and blue dye in the other.